Call Script Module is a bundle of individual modules that help you to create and maintain a record of all questionnaires /enquiries and participants. 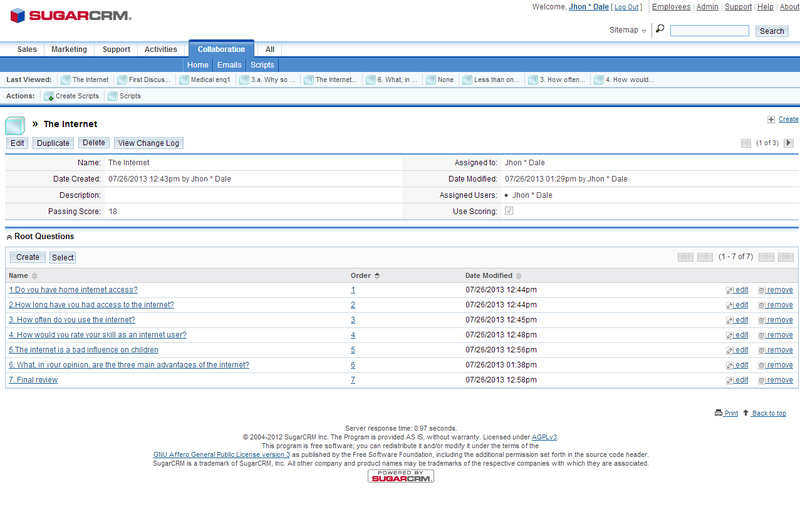 The “Script” module keeps track of all questionnaires that have been and will be created. When creating a script, you can edit the score needed to pass the questionnaire, decide if a scoring board is required and establish which leads can answer the questionnaire based on their assigned user. 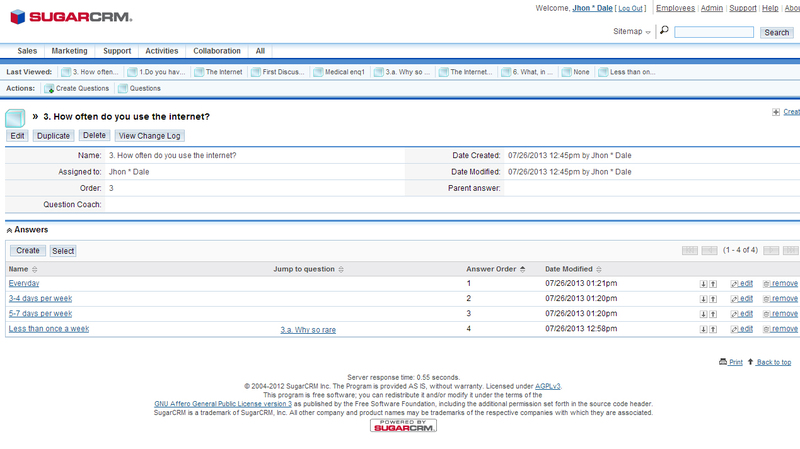 In the detailview of the newly created script, we can add questions. A place and a name must be specified in the questionnaire, for each question, and if desired, a helping note. For every question an indefinite number of answers can be defined. Each answer can have an editable value, it can be a text box or it can be a checkbox, for multiple choices. The order in which the questions are put and the number of points for each answer can be both edited. Depending on the answer, the next question in the questionnaire can be different. 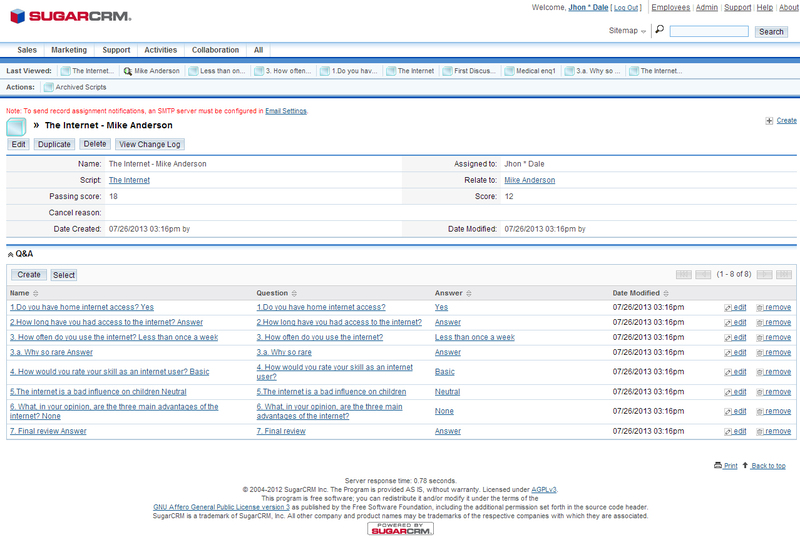 A questionnaire can be started from the action button “New Call Script” in the detailview of every existing Lead in the SugarCRM instance, or by the user when answering a call from an existing lead, if a Call manager is installed on the SugarCRM instance. 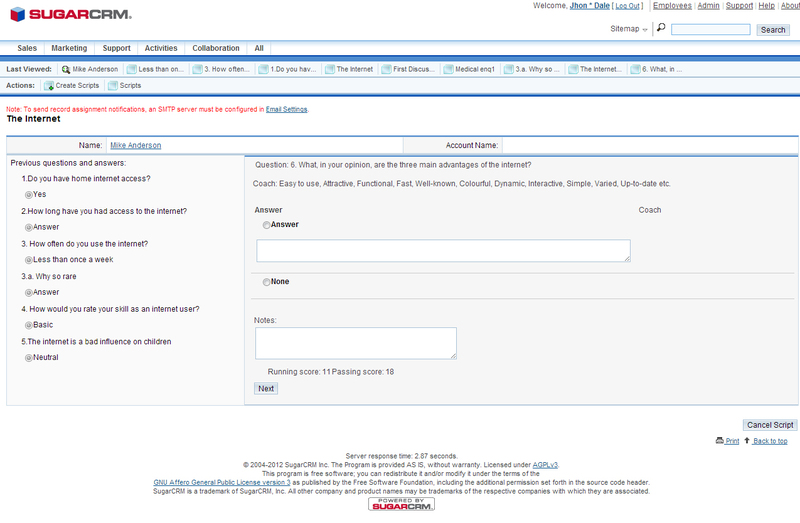 After selecting the desired questionnaire, the user will have to address the question to the lead and note every response accordingly. Throughout the course of the questionnaire, all questions and answers can be reviewed, as well as the running score and the passing score. At the end of the questionnaire, all the questions and answers will be saved and stored in Archived Script & Answers module. This is a Paid Integration , please Contact us for a Free Quote , or Add to Cart and we will contact you .